Most of us are familiar with the strengths and limitations of direct mail and email as marketing channels. Individually, they can be used in combination with different strategies to achieve different goals. But a multichannel marketing approach that integrates direct mail and email can bring the best features of each to the forefront. Direct mail doesn’t require prospect or customer permission and can reach any business and home in the U.S. with an address. We can reach relevant consumer and business names based on hundreds of demographics and interests, as well as bring analytics into the mix for highly effective targeting. Direct mail has an 80%+ open rate. It is successful across many industries when done correctly with the right combination of creative, strategy and production efficiency. Direct mail can seem expensive and intimidating to the uninitiated, and is most effective for beginners when guided by professionals with the right experience. Ongoing testing will drive the best results, and nowadays is a requirement for direct mail success. Direct mail can also require a longer lead time than other marketing channels. IWCO Direct manages many such successful direct mail campaigns for clients, where we provide in-house creative, strategy and production. Email’s biggest appeal is that it is inexpensive, relatively easy to deploy, can be well timed and is easily testable. However, it requires explicit customer opt-in permission, sees much lower open rates than direct mail and its low cost creates the frequent temptation among marketers to over-email and not invest in targeting and segmentation. It cannot be used effectively for customer acquisition; email marketers often cite low email opt-out rates as proof that they are not over-mailing, when in fact, email recipients simply tune out the never ending volume of email, deleting or ignoring rather than opting out. But what happens when we develop a strategy that effectively combines direct mail and email into a multichannel customer marketing campaign? On the front-end, there is no better tool for acquisition than direct mail, which can drive new customers to the web to both make purchases and provide their email addresses. Email is an ideal follow-up customer engagement tool that can generate repeat purchases. On the back-end, direct mail re-connects brands with customers that may have tuned out the brand’s email efforts over time. 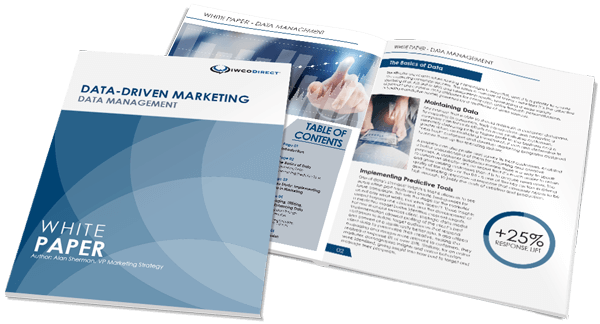 At IWCO Direct, we’ve found that leveraging direct mail and email within a single integrated multichannel marketing campaign always generates superior results when compared to standalone direct mail or email marketing efforts. Response rates can increase by up to 35%. Because direct mail has a longer “shelf life” and can linger in the home for several days or longer, it is often used in such a campaign to make the initial contact and present the offer. Email can arrive a day or two later and reinforce the call to action, closing the sale among some undecided audiences. Another email contact days later can drive up response even further. Other marketers have found success using upfront email in an introductory manner to announce the upcoming arrival of an offer via direct mail. All contacts should make use of seamless and integrated creative and messaging across both mediums. There is no one established process for integrating direct mail and email into a multichannel marketing campaign; like any other direct marketing challenge, it needs a strategy that should be tested and analyzed. Some marketers (including IWCO Direct) use the USPS Intelligent Mail Barcode, a unique direct mail tracking code with serial number and delivery point to schedule a strategic delivery sequence. We receive scan data, enabling the potential to send an email on the day of delivery or up to several days later. This is another potential direct mail and email integration opportunity. We’ve been hearing and talking about the value of multichannel marketing for years now. At IWCO Direct, we have found that a well-planned, integrated direct mail and email campaign will truly deliver superior results – greater customer engagement, higher response and improved ROMI. For more on how multichannel marketing campaigns that integrate direct mail and email can drive greater response, please contact me.